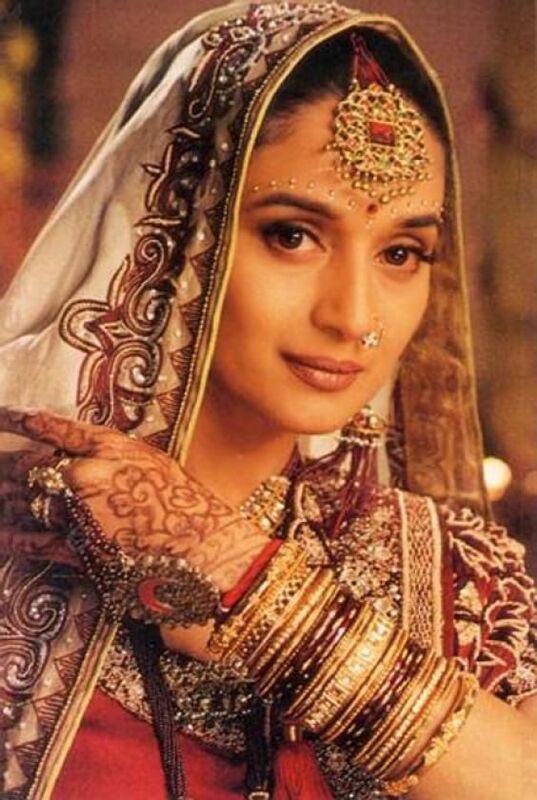 When you imagine the image of a perfect Indian bride it is a given that you would visualize her with a nose ring. 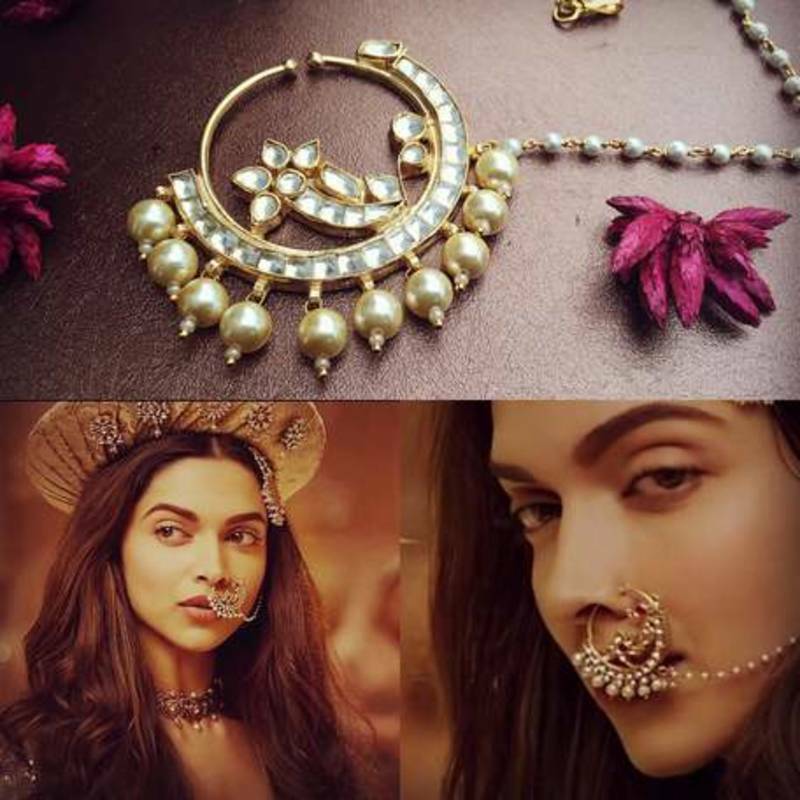 The diverse cultures practiced across the country play a role in the selection of this accessory as well. If you are wondering whether this is a new fad well be rest assured since this trend has been tried and tested as since the 16th century, which is a symbol of marriage. And more than anything else, this accessory adds a very feminine touch to the wearer. This post will take you through a few essential tips that can help you select the right once for your wedding. There are many types of nose rings and the best way to select the perfect one for you would be to consider all your options. The two most important things that you need to keep in mind is the bridal outfit and the types of nose rings that are available. In this way, you will be able to make an informed decision and look gorgeous on your wedding day. The first aspect that you need to consider is the bridal outfit that you will be wearing. The color of the saree or lehenga, embellishments, and the color of the pallu are important. In this way, you will be able to select a nose ring that matches the outfit and adds to the overall look. Depending one the region, the type of nose rings differ. Three broad classifications that can be made include the south, north, and the west. Let’s take a closer look at these nose rings. The nose ring is an important accessory that brides wear in South India. Traditionally, a bride-to-be gets her nose pierced before the wedding, unlike these days. So, it is a sign that a woman is married like the toe rings that most Tamil brides wear. When translated into English, the word ‘Mukhuti‘ refers nose piercing, which usually refers to a ring or stud. Ladies belonging to the southern part of the country pierce the left nostril. However, this is not a hard and fast rule anymore. The custom of wearing two diamond nose studs on each nostril is a south Indian tradition, which has been passed on from one generation to the next. As mentioned earlier on, these days many brides get their nose pierced and it doesn’t matter which nostril the piercing is on, as long as it suits them! It’s all about looking your best on your wedding day. The Nothern part of the country has been influenced greatly by several cultures over centuries. However, one of the legacies that have been left behind is the influence on nose rings. 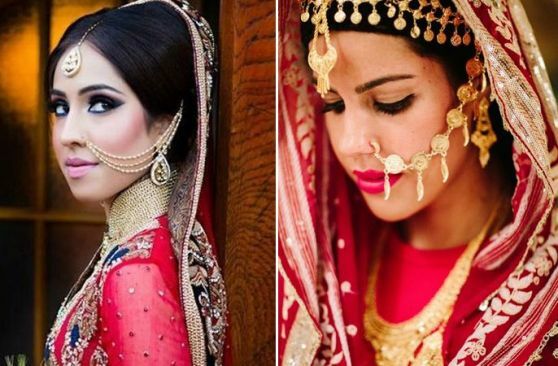 Brides in Uttarakhand and Himachal Pradesh wear fan-shaped nose rings, which is an integral piece of bridal jewelry. The specialty of this type of nose ring is that an embellished charm is attached to the ring. It is pinned to the bride’s hair and looks gorgeous to say the least. 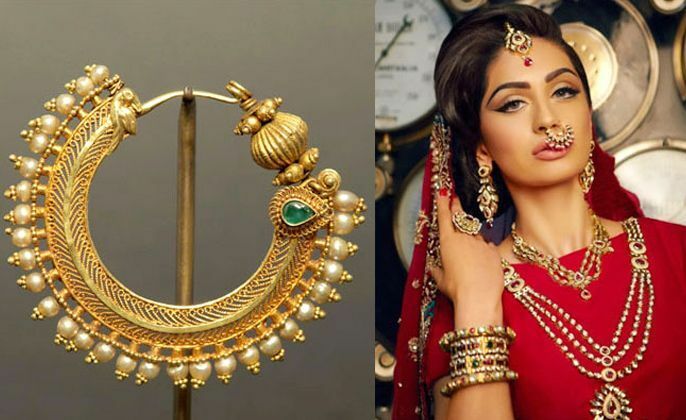 As the name suggests, this type of nose ring is particularly popular in Punjab. A large or medium sized hoop connected to a metal chain which is tucked into the hair like the Latkan. The western part of the country of the country has a few interesting types of nose rings. Let’s take a look at them! 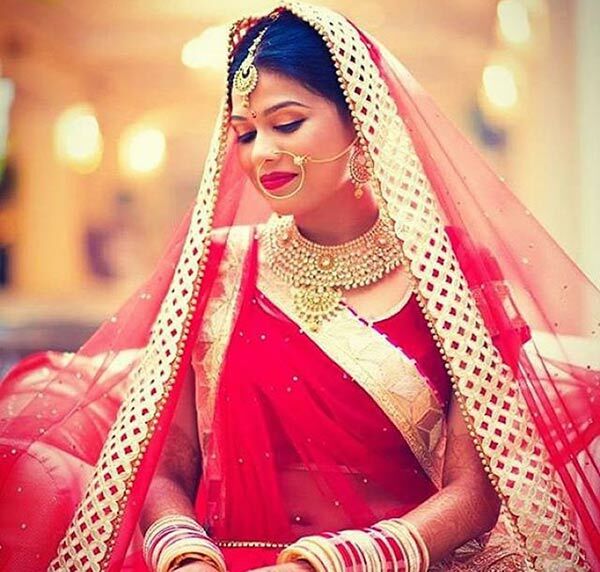 The nathni is worn by Rajasthani and Gujarati brides. It is usually made of either gold or silver and embellished with gem stones or pearls with a chain attached to it. The Maharastrian nath is unique and is known for it’s interesting cashew shape. 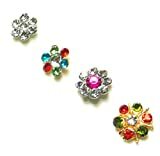 Usually, colorful beads, pearls, and multicolored gem stones are used in these nose rings. Well, for the unconventional bride, designer nose rings can be the best way to go. 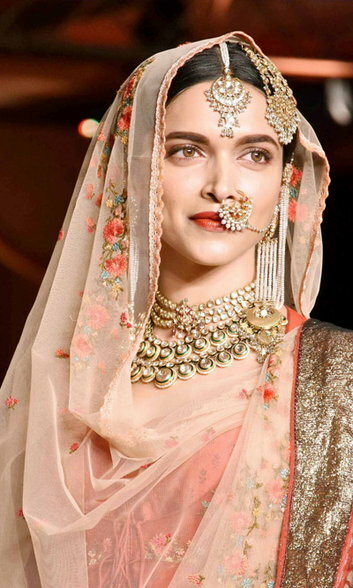 This is because designers come up with beautiful Indo-western creations that could be the perfect fit for the bride. So, don’t settle for something that you don’t fall in love with! 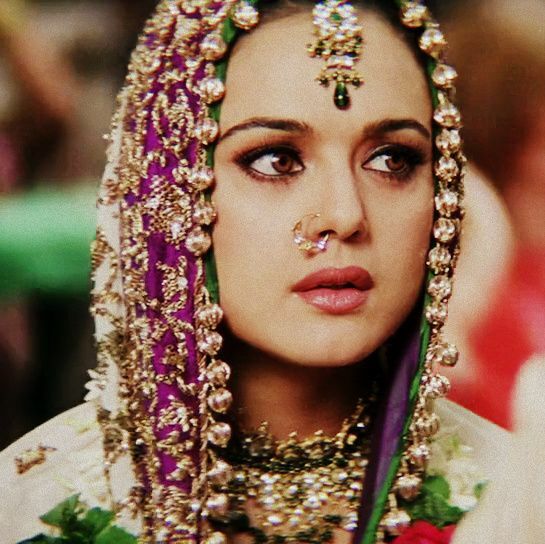 If you aren’t completely convinced that a nose ring will add to your entire look then some Bollywood inspiration would help you out. Here are some of out favorite stars wearing this accessory. Maybe, this will give you bolster confidence and try something new.